wig color | Stylistic Inc. Many people who are battling hair loss tend to give up on the wig search, finding it a challenge to find the right wig for their style and comfort. But believe us—it’s possible to find a wig that you love and feel good in! And that starts with color. Here are a few things to keep in mind when picking the color of your wig! Your skin tone helps determine the best color wig for you. Decide first if your skin is a warm or cool tone. You can figure this out by simply holding different colored shirts up to your face. We suggest red, yellow, blue, and green, at the least! If you prefer blue or green, your skin is cool-toned; when your skin looks better against the red or yellow, you have warm-toned skin. The color of your eyes can help determine which wig colors will help make your eyes pop! 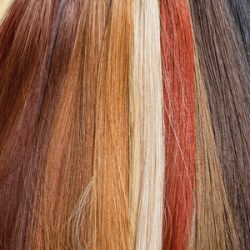 When your eyes are golden brown, green, hazel, or light blue, you may be best suited best for wigs in colors like dark brown, auburn, or chestnut. Those with dark brown, deep blue, blue-gray, or dark hazel eyes, tend to look great in wigs of natural colors like black, brown, and blonde. As we age, lighter hair and warmer shades often prove more flattering. Lighter shades also give a more natural appearance to those with paler skin tones. At Stylistics, we understand hair loss and that’s why we strive to offer comfortable wigs for every style! Call us at 602-234-3381 to schedule an appointment today and let us help pair you with your new wig!